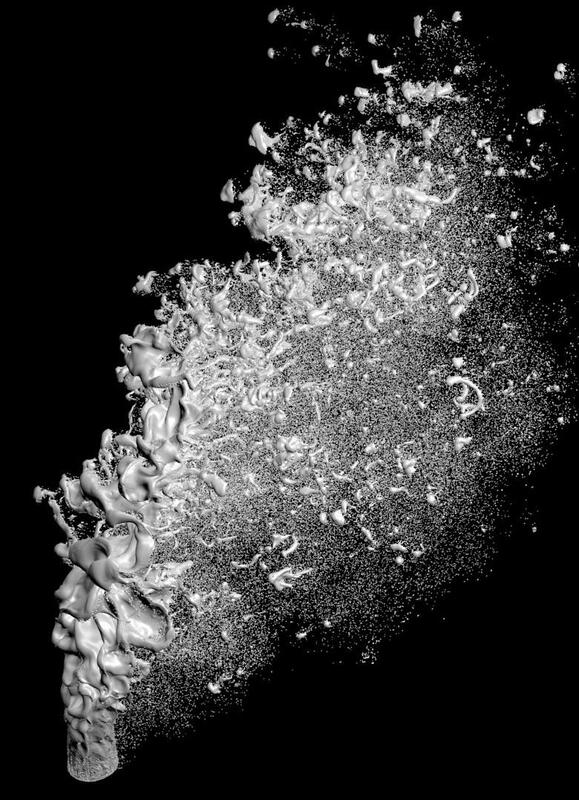 Even with all the advancements to numerical methods to date and many detailed simulations, the results have not provided a significantly deeper understanding of the atomization physics. At most, simulations results have been analyzed to recreate measurements that are obtainable experimentally with the goal of validating the numerical approach. However, after methods are validated, the rich datasets should be used to answer many fundamental questions about atomization that are challenging to answer experimentally. This step may seem logical, but has yet to occur due to the extremely large datasets that are created by these simulations and the difficulty of extracting useful information. Thisproject isdeveloping physics extraction techniques, including quantification of the primary instability and droplet ancestry statistics from direct numerical simulation (DNS) datasets to elucidate breakup mechanisms. 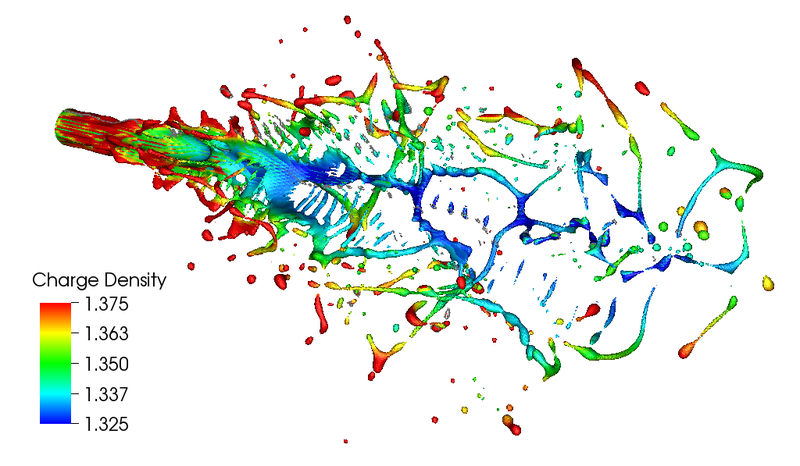 A methodology to quantify the uncertainty of computational fluid dynamic (CFD) simulations of gas-liquid multiphase flows is being developed. 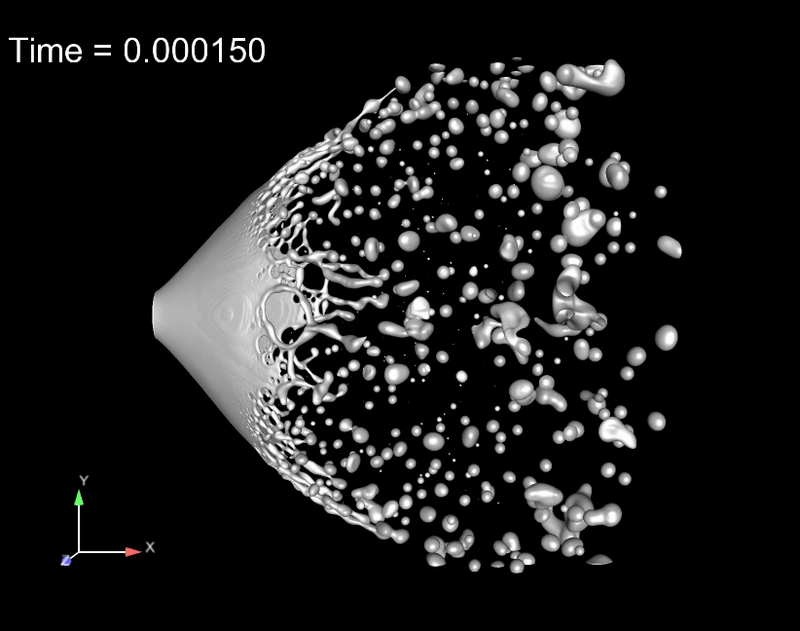 Quantifying the uncertainty of CFD solutions is an important and often neglected component of simulations. Much effort is focused on determining the order of numerical schemes used to discretize governing equations and ensuring that the computational mesh adequately resolves the flow. However, fluid properties, boundary conditions, and initial conditions are usually taken to be exact even when large uncertainty in their definition is present. While there have been significant developments of uncertainty quantification techniques for incompressible and compressible single-phase flows, the extension of these techniques for gas- liquid multiphase flows has not occurred. Coupling uncertainty quantification and multiphase flow numerical techniques will create a rigorous methodology for measuring output uncertainties from input uncertainties. The techniques will be useful for advancing the design and understanding of a myriad of engineering and environmental flows including fuel injection, proton exchange membrane (PEM) fuel cells, nuclear power generation, concentrating-solar plants, biological flows, and wave energy harvesting devices. The code for this project is being shared with an open source license, see multiUQ below for more information. Simulations of gas-liquid multiphase flows are challenging due to the presence of discontinuities at the phase interface. Standard discretization methods fail and special numerical numerical methods have been developed to solve the equations near the discontinuities. My research group has developed schemes that transport density and momentum while maintaining exact conservation. The method leverages a geometric semi-Lagrangian framework to compute consistent and conservative fluxes. We also work on improving the surface tension force calculation as this force controls the motion of the gas-liquid interface for many applications. New schemes have been developed that improve the calculation when the interface is not well resolved and the interface curvature is large relative to the mesh resolution. 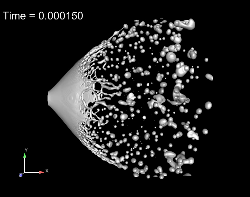 Additionally, we are exploring the connection between the length scale the curvature is computed on to the accuracy of the calculation and, more importantly, how the curvature interacts with the velocity field which creates the interface perturbations.